Just outside Napanee lurks a fearsome creature. Stalking its prey from above, it swoops down and uses its strong, hooked beak to impale its meal on spikes or thorns, to devour later at its leisure. This is the eastern loggerhead shrike, also known as the butcher bird. A predatory songbird without talons, this species of shrike is specially adapted to eat its meals without some of the tools of raptors. While it might sound like a thing out of nightmares, this shy and elusive bird is in grave danger. With less than 30 breeding pairs remaining in the wild, the eastern loggerhead shrike is one of the fastest-declining bird species in North America. The migratory shrike is a classic example of an “area-sensitive species.” It requires large areas of open terrain before it is comfortable enough to nest. Few regular, protected nesting areas remain for the eastern loggerhead shrike. But there is hope now for this species that is rarer than the panda. The Nature Conservancy of Canada (NCC) has announced the protection of 31 hectares (78 acres) of key eastern loggerhead shrike habitat north of Napanee. At risk of disappearing in our lifetime, the endangered eastern loggerhead shrike relies on grassland habitat, which has all but disappeared from Ontario. This new addition is a known nesting site for this species, and expands NCC’s Napanee Plain Alvar Nature Reserve to 121 hectares (300 acres). In 2017, biologists observed five young shrikes fledging from their nest on the property — part of the longest-occupied eastern loggerhead shrike nesting area in the Napanee Plain. The site also has globally rare alvar habitat and lies within the Napanee Limestone Plain Important Bird Area. One of North America’s great limestone plain landscapes, the Napanee Plain is a rich complex of wetlands, forests, lakes, grasslands and alvars. Naturally open habitats with a thin to non-existent covering of soil over a base of bedrock (either limestone or dolostone), alvars are home to many rare and unique species. Because of limited soil, fewer plants grow on alvars. This results in naturally open habitats that are perfect for grassland birds, including eastern loggerhead shrike. Alvars are found in just a handful of places in the world. It is also one of the areas where NCC partners with Wildlife Preservation Canada to assist with shrike recovery efforts. 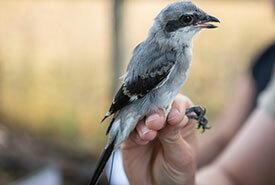 For several years now, Wildlife Preservation Canada has set up a shrike nursery on the Napanee Plain Alvar Nature Reserve, using it to raise and release young shrike back into the wild. Each year the biologists in charge of the program see success with more birds returning to breed on the alvar. The Napanee Plain is home to several other federally listed species at risk, including eastern meadowlark (threatened), least bittern (threatened) and juniper sedge (endangered). This NCC project was generously supported by funding from the Government of Canada, through the Natural Areas Conservation Program. The property will be named the Irene Ockenden Alvar Tract, thanks to a generous financial donation from Dr. Kenneth Ockenden in her memory. Other private donors, including the Kingston Field Naturalists, helped provide crucial matching funds for the project. To date, NCC has protected more than 747 hectares (1,846 acres) in the Napanee Plain area.